The Project will involve the deployment, operation, monitoring, and evaluation of two 6-meter diameter Open-Center turbines developed and manufactured by OpenHydro Group Ltd. While the project will be connected to the grid and produce a modest amount of energy, the primary purpose of the Project is to gather data to better inform the viability of commercial tidal energy generation from technical, economic, social, and environmental standpoints. This data is critical to the responsible advancement of commercial scale tidal energy in the United States. The two, 19-foot-tall OpenHydro System turbines are designed to convert the kinetic energy of water flowing at velocities of 2.3 feet per second to nearly 11 feet per second into electricity. Each turbine is designed to generate 300 kW. The turbines are expected to rotate about 70 percent of the time, producing 244,000 kW hours of energy annually. Installing the turbines will require a specialized barge and multiple support vessels. The turbine installation barge will be towed to the site by a tugboat and installed during the slack tide and under calm sea conditions. Once the turbine installation barge is centered over the installation site, winches onboard will slowly lower the turbine to the seafloor. A submersible, remotely operated vehicle will monitor the placement of the turbine on the sea floor. The installation process is expected to take less than one hour. At the end of the license period of up to 10 years of operation, the turbines will be removed from the sea floor using the same method as for installation, in reverse. This procedure will also be followed for any necessary maintenance on the turbine or components during the license period. Two electrical transmission cables (one for each turbine) will be installed by a combination of horizontal directional drilling (HDD) and directly laying cable on the seafloor. The HDD work will require a bore pit on land approximately 8 feet by 12 feet by 6 feet deep and will drill underground to approximately the 19-meter water depth contour, where it will exit underwater. Scuba divers will be present to oversee the HDD exit. From the exit point, the cables will be directly laid on the sea floor by a specially equipped cable-laying vessel coupled to the turbine installer barge. No anchors will be used to hold the transmission cables in place. To avoid additional disturbance of the sea floor, the cables may remain in place after conclusion of the pilot project and removal of the turbines. The District will evaluate the condition of the cables at the conclusion of the project and discuss with appropriate agencies whether to leave them in place or remove them. Two semi-permanent anchors with acoustic releases are proposed to aid in deployment and retrieval of monitoring equipment and conducting ROV surveys. The anchors will be either embedment type or concrete blocks depending on further analysis of the sea floor substrate, and will be installed prior to the turbine and cable installation. The anchors will be designed to stay in place for the duration of the pilot project. The District anticipates removing the anchors at the conclusion of the project. The approximately 800 square foot terrestrial utility structure (control room) will be constructed on private property outside of the shoreline area. Underground cables will be trenched a distance of approximately 70 meters from the power control building to connect to Puget Sound Energy’s electric distribution system. The two turbines will be placed about half a mile from the Whidbey Island shoreline at a water depth of approximately 190 feet. This site location sits on the east side of Admiralty Inlet, which is in the northwest portion of Puget Sound between the Olympic Peninsula and Whidbey Island where Puget Sound meets the Strait of Juan de Fuca, Washington, USA. On June 30, 2010, the District informed the Commission that, through facilitated discussions, it had resolved many of the outstanding disputes (adequacy of baseline information for aquatic resources, installation and operation protective measures for SRKW, and a timeline for the development of monitoring plans and an adaptive management process). The Snohomish PUD proposed to file a file license application by October 31, 2010, but additional information requests required more time to complete. Therefore, the Snohomish PUD filed the pilot project final license application on March 1, 2012. In reviewing the application, Commission staff held three technical conferences to discuss issues associated with project installation and operation and issued draft and final Environmental Assessments on January 15 and August 9, 2013 respectively. Staff needs the information to grant the waivers and complete its environmental analysis. On September 30, 2014, Snohomish PUD announced that the projects will no longer advance, stating that the US Department of Energy decided not to share the rising costs of the next stage of development. According to the PUD, the requirements became more onerous than expected for a temporary research project. April 19, 2012 – Structural Design and OpenHydro Tidal Technology Preliminary Design Report for Snohomish County PUD No. 1. Section 18 of the FPA (fishway prescriptions) U.S. Department of the Interior (Interior) on behalf of the Fish and Wildlife Service (FWS) Interior requested a reservation of authority to prescribe fishways under section 18 on May 23, 2012. Section 10(j) of the FPA National Marine Fisheries Service (NMFS), FWS, and Washington Department of Fish and Wildlife (Washington DFW) NMFS, Interior, and Washington DFG filed 10(j) recommendations on May 23, 2012. Washington Department of Ecology (Washington Ecology) NMFS, Interior, and Washington DFG filed 10(j) recommendations on May 23, 2012. Endangered Species Act Consultation NMFS, FWS Formal consultation with NMFS was requested on April 23, 2012 and January 22, 2013; a biological opinion was due on June 7, 2013. FWS concurred with staff’s determination of not likely to adversely affect listed species on June 12, 2012. Marine Mammals Protection Act NMFS Proposed construction and operation may adversely affect marine mammals. Snohomish PUD intends to request an Incidental Harassment Authorization pursuant to the Marine Mammal Protection Act after the license is issued but before any marine activities are conducted for the project. Magnuson-Stevens Fishery Conservation and Management Act NMFS Project installation and operation is not expected to adversely affect Essential Fish Habitat (EFH). An EFH assessment was provided to NMFS on April 23, 2012. Coastal Zone Management Act Consistency Washington Ecology Washington Ecology received a Coastal Zone Management Act consistency certification on March 26, 2012. Washington Ecology has not yet acted on the request, which was due September 24, 2012. National Historic Preservation Act Washington State Historic Preservation Office (Washington SHPO) Washington SHPO concurred with a finding of no adverse effect on historic properties on February 28, 2012. Potential harm due to blade strike on southern resident killer whale (SRKW) and listed salmon and steelhead, potential noise disturbance and displacement of SRKW; potential electromagnetic field (EMF) effects on SRKW and listed rockfish; potential effects of habitat alteration for listed rockfish; and potential navigation impairment by towboats. 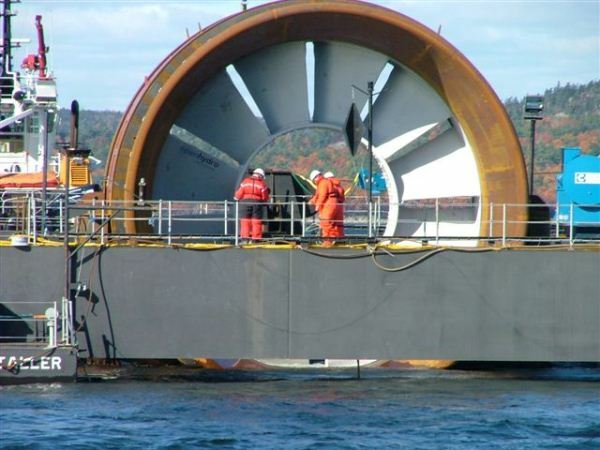 Admiralty Inlet Pilot Tidal Project is located in United States of America. Deployed underwater noise measuring equipment in proposed project area. Modelling of anticipated underwater noise effects using ambient data collected from project site conditions together with noise outputs of a similar Open Hydro 10-meter turbine in the Bay of Fundy and its 6-meter turbine at EMEC facilities to determine anticipated pilot project acoustic effects on marine mammals. When taken in the context of pre‐installation ambient noise, the noise from turbine operation is not likely to be routinely detected by marine animals at distances greater than a few hundred meters from the project. Observations made aboard the support vessel and barge using Global Diving’s Remotely Operated Vehicle (ROV) Seaeye Cougar-XT. Based on these observations and organism counts it appears that the turbine site can be characterized as a coarse-grained, cobble, pebble, boulder habitat for encrusting organisms and Sculpin, although some rockfish appear to use the habitat as well. Epifauna such as sunfish and urchins also use the habitat. From 1987-2008, Washington DFW conducted 50 trawls in Admiralty Inlet within the depth range of 31-60m, depths within which the turbines would be deployed. The primary crustaceans collected were dock shrimp, Alaskan pink shrimp, giant barnacle, Dungeness crab, and red rock crab (Snohomish PUD, 2012). The primary echinoderms collected were green sea urchin, sunflower star, red sea cucumber, and red sea urchin. The most abundant mollusks collected were pink scallop, California market squid, and northern horse mussel. Other invertebrates collected included gigantic anemone and warty sea squirt. Ratfish (65% of the catch), Pacific sanddab (5%), English sole (4%), southern rock sole (4%), great sculpin (3%), buffalo sculpin (2%), Pacific tomcod (2%), spiny dogfish (2%), and Puget Sound rockfish (2%). All species of rockfish caught (Puget Sound, copper, greenstripe, quillback, redstripe, and unidentified rockfish) composed 5% of the total catch. Washington DFW surveys at the two locations nearest the project site. The most numerous fish sampled were spotted ratfish, ribbed sculpin, buffalo sculpin, grunt sculpin, kelp greenling, and lingcod. No salmon were captured in trawls at either of these locations. Mobile hydro-acoustic surveys to determine fish densities in deployment area. Also deployed acoustic tag receiver on the seabed to collect information on presence and use of the project area by tagged species, such as the federally listed green sturgeon and several salmon species. Preliminary results indicate minimal to moderate use of deployment area by fish; however, methods do not allow determination of use by species. Test organisms were collected and exposed to a range of sounds associated with turbine noise. Fish were assessed at four different time points for tissue damage and changes in hearing sensitivity. Chinook salmon and the results indicated low levels of tissue injury and no effects on hearing. 12 years of surveys (1992 -2004) conducted by Washington DFW. Harbor seals are the most commonly sighted (687 sightings) marine mammal within 0.4 km (0.25 miles) of Admiralty Inlet, followed by harbor porpoise (67 sightings), Dall’s porpoise (16 sightings), river otter (12 sightings), killer whale (10 sightings), and California sea lion (8 sightings). Shore and boat-based observations, coupled with acoustic monitoring of whale echolocation using hydrophones, to determine timing and extent of use of the federally listed endangered SRKW in deployment area. There were an average of 60.5 whale days per year in Puget Sound from 2001-2008, and 70% of these whale days were concentrated in the months of October through January. 2010 AIS tracking statistics used to analyze frequency of ship collisions. Proximity to shipping lanes and the presence of commercial fishing or recreational diving also explored. The District’s tidal energy project should present little or no hazard to Puget Sound navigation safety. A combination of survey cruises and bottom-mounted instrumentation have been deployed in Admiralty Inlet in the region surrounding a prospective tidal energy device deployment. Measurements and comparison to longer time series indicate significant temporal variability in water quality on tidal, seasonal, and annual time scales. Depending on the season, there may be considerable vertical variations. Observations will be taken of six sampling sites and the two turbine sites with a Remotely Operated Vehicle (ROV). Fish abundance and size will also be recorded. Experiments similar to those completed on the Chinook Salmon will be performed on a local physoclistous species for evaluation of physiological response to exposure from tidal turbine sound. The leading candidate at this time is a rockfish because they are likely to live in close proximity to the turbines. Post-deployment monitoring using multi-beam acoustic camera and lighted video to detect and observe marine species interactions between pilot project turbines and fish/marine mammals; deployment of digital broadband hydrophone that allows real-time measurement of turbine noise and collection of marine mammal use of project area. Details of monitoring plans still under agency consultation and review. SRKW protection plans tied to Pacific Northwest National Lab efforts to define monitoring protocol. Turbidity, spills, leaching, conductivity, temperature, dissolved oxygen, and pH will be monitored during all stages of construction and operation.